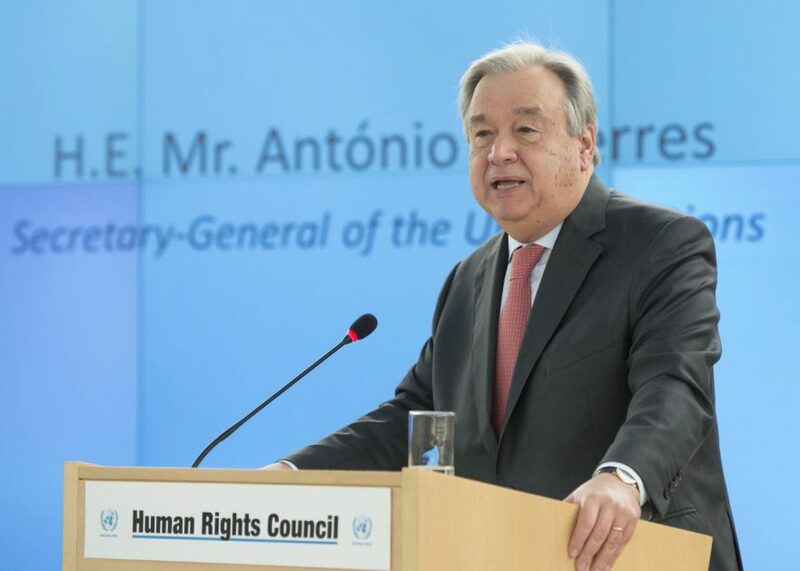 Secretary-General Antonio Guterres has set about the modernisation of some sectors of the United Nations and has been fulsome in his recognition of the interrelatedness of the three sectors of the UN: peace and security, development, and human rights. He has made impassioned statements about the need to protect human rights. But, beyond rhetoric, there has so far been no indication of an intention to extend the modernising effort to the human rights sector. Human rights have not really been up front, so far. Why is this so? Human rights need his leadership. Why have human rights been the missing chapter in the Secretary-General’s strategic priorities? We have seen this before. Dag Hammarskjöld was a great Secretary-General. Promoting development was his leading priority. He brought in the concept of preventive diplomacy and played a leading role with Lester Pearson in the introduction and evolution of UN peacekeeping. He undoubtedly believed in human rights, but he did not want the issue to complicate his tasks. So, he told the UN human rights director, John Humphrey: ‘I want you to keep the human rights programme at Minimum Flying Speed.’ Humphrey relates this in his Memoirs. Might history be repeating itself? Following his assumption of office, the Guardian described Secretary-General Guterres as ‘Intellectual, affable, progressive…made for the job.’ Without a doubt, the Secretary-General has many talents and is a superb leader who has passionate beliefs, including about human rights. But where, then, are human rights in his strategic priorities? He has had many high-sounding things to say about human rights: In an article in Newsweek shortly after taking office, he wrote: ‘It is time for all of us to remember the values of our common humanity, the values that are fundamental to all religions and that form the basis of the UN Charter: peace, justice, respect, human rights, tolerance and solidarity’. His vision is of a United Nations that advocates for the excluded and vulnerable, and works with national partners in the advancement of all human rights: economic, social, and cultural, as well as civil and political. Going beyond these fine words, where has he put his emphases? Taking the oath of office, Guterres highlighted three strategic priorities for the Organisation: working for peace, supporting sustainable development, and reforming its internal management. In a just-released report on Repositioning the UN development System to deliver the 2030 Agenda, he wrote about his strategic priorities as, ‘A set of mutually-reinforcing efforts, which I have launched to ensure that the United Nations responds to changing global needs. These include a review of the peace and security architecture and of our internal management, as well as clear strategies and action plans to achieve gender parity, end sexual exploitation and abuse, and strengthen counter-terrorism structures.’ No mention of human rights here. In his address upon taking the oath of office, Guterres identified what he saw as ‘megatrends’, including climate change, population growth, rapid urbanisation, food insecurity, and water scarcity, which had increased competition for resources and heightened tensions. Conflicts, he said, had become more complex. They produced horrific violations of international humanitarian law and human rights. People had been forced to flee their homes on a scale unseen in decades. And a new threat had emerged – global terrorism. Fear was driving the decisions of many people around the world. We must understand their anxieties and meet their needs, without losing sight of our universal values. Guterres is concrete when he addresses the need for reforms on issues of peace and development, but so far not about human rights. On peace and security issues, he commented upon taking the oath of office that, often, the United Nations was tasked with peacekeeping in places where there was no peace to keep. He said that a greater conceptual clarity and a shared understanding of the scope of peacekeeping was needed so as to pave the way for urgent reforms: ‘Inspired by the new concept of sustaining peace, it is time for us all to engage in a comprehensive reform of the UN strategy, operational set up and structures for peace and security.’ Guterres also emphasised the need to do more to prevent and respond to the sexual violence and exploitation committed by those serving under the UN flag against those they are supposed to protect. He has since announced a new position in his office, an Assistant Secretary-General for Victims Rights focusing on the protection of people from sexual violence. On Sustainable Development, he wrote in his recent report on repositioning the UN development system, ‘We seek to be a 21st century thought leader that draws on its unparalleled universal reach to be at the forefront of policy making and innovation, bringing in national and regional perspectives to the global debate.’ He is aiming for, a recalibrated UN development system, with a new generation of Country Teams, supported by bold and accountable leadership. He also is pursuing a delinking of the functions of UN Resident Coordinator and UNDP Resident Representative on the ground. Guterres’ remarks to the Human Rights Council on 27 February 2017 were undoubtedly a supportive one and impassioned one. Disregard for human rights, he stated, was a disease, and it was a disease that was spreading – north, south, east, and west. The Human Rights Council must be part of the cure. Human rights must never be seen as a luxury or ‘saved for later’, after peace and development had been achieved. Human rights were an intrinsic part of all that the UN did, ‘and all that we are.’ ‘And so, we must speak up for human rights in an impartial way, without double standards.’ The integrity and credibility of the Council would only be enhanced by proceeding in a manner that avoided unbalanced treatment of Member States. Without a doubt, this was an eloquent and moving address. But was it strategic? There are numerous structural problems that would deserve the attention of the Secretary-General in the human rights field. Future UN support for the human rights Treaty Bodies is one of them. Deliberate efforts are underway to weaken the role of the treaty supervisory bodies. The role of national human rights infrastructure in the development process is another issue that needs urgent attention. The role of the Office of the High Commissioner as the human rights component of a global watch over human security deserves priority attention. Writing about the development sector in his recent report, the Secretary-General stated: ‘I am convinced…that the current model has reached its exhaustion point and is insufficient to match the ambition, effectiveness and cohesion required by the new agenda.’ In preparing his report a reference group of individuals with recognized experience in development practice and policy had been established to serve as an informal ‘sounding board’ as the work moves forward. Shouldn’t the human rights sector of the UN be accorded similar attention? There certainly is need for fresh thinking in modernising the UN human rights system. The human rights system needs the Secretary-General’s thinking and leadership. Injecting some dynamism into the mainstreaming of human rights could be a good place to start. Dr Bertrand G. Ramcharan, BA (Hon.s) History; Ll.B. (Hons. ), Ll.M. Ph.D. (LSE), Barrister-at-Law. Previously: UN High Commissioner for Human Rights Ag., Professor of Human Rights at the Geneva Graduate Institute; Chancellor of the University of Guyana; Commissioner of the International Commission of Jurists. Feature photo: Official visit of Secretary-General Antonio Guterres speaks during the High Level Segment of the 34th Session of the Human Rights Council. 27 february 2017. UN Photo / Jean-Marc Ferré, licensed under CC-BY-NC-ND 2.0.